When it comes to sleep apnea, CPAP therapy is not your only option. CPAP therapy is one of the most common sleep apnea treatments used today, but it’s not ideal for everyone. One of the biggest issues with CPAP therapy is compliance; people have difficulty getting used to CPAP machines and often enough can’t wear it long enough to treat their sleep apnea properly. In a previous blog, we went over a few of the reasons why compliance is such a big issue in CPAP therapy. If CPAP therapy hasn’t worked for you, you should know that it is not the only sleep apnea treatment available to you. Oral appliances have been shown to be an effective treatment option for many of our patients, and today, we’ll go over how they work and the benefits of using them. In obstructive sleep apnea, the airway is blocked, making it impossible to breathe continuously while you’re asleep. Oral appliances work by moving your jaw and tongue forward. This opens up your upper airway, allowing you to breathe freely again. What are the benefits of using an oral appliance for sleep apnea? You more likely to actually use it – Sleep apnea treatment only works if you actually use it, and there is a long list of reasons as to why people just don’t stick with CPAP therapy. Oral appliances don’t require any whirring machines, tubes or masks, making compliance rates much better than that of CPAP therapy. It’s very portable – Another common issue CPAP therapy users run into is limited portability. Sure, there are portable CPAP machines available, but having to drag around your CPAP equipment makes traveling light almost impossible. Oral appliances are very portable and don’t require a power source and a lot of extra equipment to haul around. It’s discreet – Not only can CPAP therapy be cumbersome for the person receiving it, it can be trying for their partner as well, especially if they are a light sleeper. An oral appliance is quiet discreet; it likely won’t even be visible to your partner when your mouth is closed. It doesn’t require a power source – A CPAP machine is just that — a machine. It requires a power source to run your CPAP machine, which can be unpredictable when you’re traveling. Oral devices require no plugs or batteries, and you won’t need to use any energy to get your sleep apnea therapy with an oral device. 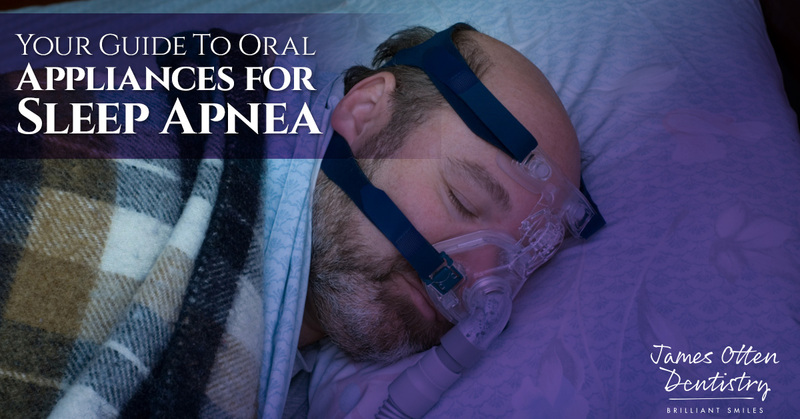 It could provide immediate relief – Most patients who use oral devices for sleep apnea therapy report immediate improvement after the very first night of use. Is an oral appliance the right sleep apnea treatment option for you? As you can see, oral appliances can be very powerful tools for treating your sleep apnea, but they are typically best used for people with mild to moderate sleep apnea. If you are struggling with CPAP therapy and you think an oral appliance might be a better option for you, schedule an appointment with our dentist in Lawrence. Contact us today to schedule your appointment, and visit us online to learn more about treating sleep apnea with an oral appliance.